After a day at sea Rick was much revived by the time we reached Hobart on the morning of February 13. There was some rough weather during the sea day but it was bright & sunny when we left the ship in Hobart. We spent the day walking around the center city outside the port. Founded in 1804 mostly as a penal colony, Hobart is the second oldest city in Australia after Sydney. Its population is just over 220,000. It is a gateway to Antarctica and closer to the Antarctic coast than to Perth, Australia. It had a thriving whaling industry for many years. Aboriginal people had lived in Tasmania for at least 35,000 years before the coming of the British, but no pure Aboriginal people are left here after many years of violence & diseases brought by the settlers. We walked out along Hunter Street, a row of very old warehouses now converted partly to shops. Our first stop was the Tasmanian Museum, where we spent some time learning about the local fauna & the history of the settlers’ relations with them (not good until recently). There were a lot of stuffed specimens. Notably a wombat standing on its hind legs is a copy of one sent to England in the 19th century. It seems that the taxidermist had never seen a wombat & decided that the very hard & thick skin on its rump came from rearing back on its hind legs. In fact, wombats move on four feet and never rear up on two feet; the extra hard skin in that area is a defense mechanism, which they turn toward the opening in their ground holes when predators are near. Similarly the ferocious appearance of a Tasmanian Devil with its mouth open was long thought to be an aggressive gesture, but it is actually more like a huge yawn. We walked past the Maritime Museum, housed in what used to be the Tasmanian Public Library. Built in 1904, a plaque outside says it was contributed by Andrew Carnegie. We hadn’t known before that Carnegie built libraries outside of North America. We walked up to find the Hobart Synagogue. Built in 1845, it is the oldest synagogue in Australia. In the back are hard benches where the Jewish convicts were marched in for services. It is one of only a handful of synagogues in the world built in the Egyptian Revival style, with lotus topped columns & trapezoidal windows. It is quite small but pretty interesting. The current library isn’t anywhere near as interesting as the old one was. It is a steel & glass box, looking like something from the 1970’s or 80’s. The inside is all modern as well. We also stopped by St David’s Cathedral. We think it is Anglican. We visited Salamanca Square, an area of old dockside warehouses that has been transformed into trendy restaurants & shops. We walked across the Parliament Gardens outside the Tasmanian Parliament building and on to the Post Office, where we bought stamps & mailed some postcards. We passed a pub where we didn’t eat lunch but enjoyed the signs. Well, that was enough for one day so we headed back to the harbor for a late lunch. We had delicious fish & chips in a place called Mures, a restaurant on the waterfront owned by a family that catches, processes & prepares the fish itself. As we walked back to the ship we passed some waterside sculptures of penguins, a seal & a sea lion. We were originally scheduled to leave Hobart in the wee hours of the morning for a short jaunt to Port Arthur, our next scheduled port. But the day before we arrived the Captain announced that a nasty storm was heading for the west coast of Tasmania, so to avoid it we would all have to be aboard by 8:00 for a 9 PM departure back up the east coast, skipping Port Arthur. This was a disappointment since we were looking forward to seeing the remains of the famous convict prison at Port Arthur, but safety first. In the late afternoon, however, it was beautiful in Hobart and hard to believe such bad weather was imminent as we gazed around the sunny harbor. We were scheduled on an after-sundown excursion to Bonorong Wildlife Park that wasn’t due back until 10:00. It was to be a nocturnal visit after the park was closed that would enable us to see these mostly nocturnal animals up and about, rather than asleep as they usually are during the day. We were notified that the trip would still be run, but moved up an hour so that we could be back by 9:00 when the Captain wanted to sail. This was good news, but it meant that we would be leaving the park around sundown, so the visit wouldn’t actually be nocturnal. As it turned out, that really didn’t matter. It was a fairly long drive to Bonorong. This looks a lot like a zoo, with different animals in their own fenced off areas. But in fact it is a sanctuary, where injured or endangered animals are brought for help. For example, it is not unusual for a kangaroo to be hit by a car and sometimes a joey will be discovered in the dead kangaroo’s pouch. The joey can be brought here to be nurtured in safety. Their goal is to nurture the animals to a point where they can be released in the wild, although some will never reach that point. The animals are not sold to zoos. As noted, it was after hours so only our group was there (2 buses worth) & we were shown around by very knowledgeable park attendants who are very committed to their mission. We started with the kangaroos, which were in a fairly large open area that allowed them to run (jump) around. We were each given a bag of kangaroo food to use to introduce ourselves to the friendly kangaroos. As we left the kangaroos we were told to dump the remaining food on the ground, where the kangaroos continued their repast. We saw several kinds of birds. The most colorful were the small Rainbow Lorikeets. Others included the Laughing Kookaburra and the Frogmouth. We were shown a Spotted-Tailed Quoll, a rarely seen species. It is an aggressive creature, darting up its cage to grab the food offered to it. There were a few Koala’s (they are not bears). Koalas only eat Eucalyptus leaves, which are not all that nutritious. Therefore they are not energetic & spend almost all their time sleeping. Our guide woke one up. He looked very bored, like a guy who has just been told to go back to work. But he was a trouper, tolerating everyone petting his shoulder while he stared resignedly off into space. An Echidna is a marsupial that looks kind of like a porcupine. It has a long nose with a longer tongue & eats ants. For defense it rolls up in a ball with all of its spines sticking out. The Echidna here can never be released into the wild because it has only three legs, which prevents it from effectively rolling into a ball. When he finished the food he was given he toddled over to the attendant and looked up expectantly, indicating that he knew there was more where that came from. The Tasmanian Bettong is a furry little creature that is now extinct on the mainland, largely due to foxes, dogs & cats. It is nocturnal, very small and thus not often seen. Fred is a Sulphur Crested Cockatoo, named for the yellow crest on its head. Fred is (really!) 103 years old. He was inherited by Bonorong from Fred’s original owner. He is very loud & talkative. If you say “Hello, Fred” he will say it back. When Rick walked by without talking to him Fred said “What’s your name, mate?” For an old guy he can put up quite a squawk. We saw a few other birds around the park unenclosed, particularly a free Sulphur Crested Cockatoo sitting high in a dead tree on the edge of the park. Wombats are furry creatures. They are raised at Bonorong for about 3 years before being set free. The small ones enjoy & need a lot of cuddling & care, but at that age they turn, sometimes suddenly, and can attack their handlers. They are nocturnal & normally you will only see their behinds, covered with especially thick & hard skin, sticking out of their holes. The Tasmanian Devil is the quintessential animal of Tasmania. It looks nothing like the one in the Warner Brothers cartoons, but it does have a reputation for being extremely aggressive & nasty. If you see several of them digging into a carcass, baring their teeth & screaming at each other, you might think that reputation deserved. But mostly they are not like that. They are an endangered species today, mostly because of a virulent strain of facial tumors that is very contagious. Bonorong is one of several places in Tasmania & on the mainland that are trying to protect the species by keeping some of them isolated from others of their kind. They are marsupials. The mother gives birth to about 25 babies at a time, each about the size of a grain of rice. But she only has 4 teats in her pouch so the first four to latch on will be the only ones that survive. She eats the rest (yuk). Their normal life span is only about 6 years. We made it back to the ship just at 9:00, in time to have dessert with our tablemates. The ship sailed down the Derwent River, then turned north to sail back up the east coast of Tasmania. The plan was to turn west after we reached the north end of the island, then sail west along the Australian coast to our next stop, Kangaroo Island. The weather was supposed to be less severe north of Tasmania than if we had taken our scheduled route northwest from the southern tip of Tasmania. As the Captain commented later the next day, however, it would be nice if the weather forecasters were aboard to experience just how wrong they can be. After a fairly rough crossing of the Tasman Sea we got up early for the sail-in to Sydney on the morning of February 10. As we stood outside the harbor shortly before sunrise we could already tell that the morning would be gray & overcast. As we started to sail in, the sun tried to rise but made very little progress in lighting the area. We passed Fort Denison, a tiny island that served as a punishment site during convict times and was fortified as a defensive installation during World War I. Behind it as we passed was the iconic Opera House. We sailed under the Harbor Bridge, one of Sydney’s iconic sights, built in the 1930’s. Inside the bridge we proceeded to our docking location at White Bay. The best docking space is at Circular Quay, right next to the Opera House. The Amsterdam was last allowed to dock there in 2015. Now the rule is that ships that can fit under the bridge must go to White Harbor while larger ships, like the Norwegian Jewel in the Opera House picture above, get to dock at Circular Quay just outside the bridge. White Bay is much less convenient, requiring a long shuttle bus ride to downtown. This time, because they are building a light rail downtown, our shuttle bus only went as far as Darling Harbor, a substantial walk from downtown. Well, unfortunately you are not going to see much more of Sydney unless you look at the 2016 links above. Rick got sick the day before we arrived in Sydney so he spent almost the entire two days here in bed. That really put a damper on things. But we had tickets to see Carmen at the Opera House the night we were in Sydney – opening night, no less. So we had to go to that, sick or not. In fact, Rick had purchased the tickets for five people & he had to be there to show his identification in order to pick up the tickets. So if Rick didn’t go no one could go & the tickets were quite expensive. So we went. And it was great. You can’t take pictures during the opera, but pictures were allowed inside while the curtains were closed. At the opera we were seated near some people from the Viking Sun, which is also on a world cruise. The ship had been docked right next to us for most of the day, then left. We assumed its visit to Sydney was over, so were surprised its passengers were at the opera. One of them told us that the Sun had moved to Circular Quay just for the night in order to ferry its passengers to the opera and would be docked next to us again in the morning. Well, that is a pretty expensive thing to do, thousands of dollars. We heard later that, since this was Viking’s first world cruise, the real motivation for the move was to get publicity photos of the ship docked next to the Opera House. Be that as it may, this made HAL look pretty bad in comparison. Worse, a private company called Captain Cook usually runs a ferry from White Bay to Circular Quay for about $5 each way, but it wasn’t available to us this visit, when it would have been particularly useful because of the street construction limiting the shuttle bus. It turned out that Viking had rented the entire operation exclusively to ferry its passengers to and from Circular Quay. One of HAL’s officers was heard to comment that this was a good idea but not within HAL’s budget. It seemed to us that HAL might have used its tender boats to ferry passengers to Circular Quay, but it didn’t do that either. Our friends Robert, Bill & Peggy went on an excursion the first day in Sydney to climb to the top of the Harbor Bridge. It’s expensive & very elaborate, with special clothes and everything tethered to ensure nothing can fall off. You can’t take a camera up with you, but the folks that run the tour are happy to sell you some pictures. We saw people at the top of the bridge on our last visit, but we didn’t go up there. On the second day in Sydney Rick was still bedridden, so Mary set out with Bill, Robert & Peggy to visit The Rocks, the area around Circular Quay where the first convict settlement was located. They took the shuttle to Darling Harbor then walked the rest of the way, very doable on a nice day like this. They spent time in a weekend market, explored the area & had lunch at a restaurant before returning to the ship. We set sail from Sydney, hoping that Rick would be fully recovered & ready for a full day in Tasmania. After a night of pretty rough seas as we rounded the bottom of New Zealand, we came to Fiordland National Park on the morning of February 7 (Rick’s sister’s birthday . . . Happy Birthday Barbara!). Established in 1952, Fiordland National Park (yes, they spell it with an i instead of a j here) covers almost 3 million acres of southwestern New Zealand. The Maori hunted here and gathered greenstone from the rivers, but apparently didn’t actually live here. European whalers landed here & even built some small settlements, but the forbidding environment has effectively deterred human development. Fiordland’s coast is mostly a series of what the New Zealanders call “Sounds,” but are really fjords: very deep inlets with steep walls formed by glacial activity. We spent the day cruising three of the sounds; no landings but a whole lot of stunning scenery. Dusky Sound was the first we came to after turning the corner to go north along the west coast. of New Zealand. Because of its location, far from any towns, this sound is not visited by many. I don’t really know anything to say about it so here are some pictures. It was cloudy & gray in the early morning & we spent about an hour in Dusky Sound. Dusky Sound has an exit through what looks to be Breaksea Sound on a map. After exiting Dusky Sound we sailed to Doubtful Sound, further up the west coast. By the time we got there the sky had cleared a lot, so the vista was much broader. We spent about an hour in this sound as well, then exited through what the map indicates is Thompson Sound. Doubtful Sound also gets relatively few visitors, but we had another cruise ship, the Norwegian Jewel, ahead of us the whole time. Finally we came to Milford Sound. This one is more accessible & receives many more visitors than the others. It is shorter than the others & has no exit so we had to turn around to sail out again. But it is also probably the most beautiful, with higher peaks shooting up straight out of the water. You can see below that the skies were now mostly clear & the sun was out. We saw several fine waterfalls, but we were told that if it had been raining for a few days there would have been many more. At the end of Milford Sound is a hotel, in a perfect setting on the water with a large waterfall on one side & a mountain with a glacier behind it. We saw a few planes & helicopters landing there. We were told that some folks hike to this spot, which takes several days along a well established walking track. A road has been built through the wilderness as well & we saw a bus at the hotel. As I mentioned before, the ship had to turn around to sail back out of the Sound. When it did so, there was a huge wind on the front of the ship. Too much to take, so we made our way to the aft pool, where we could watch the Sound recede as we sailed out in relative comfort. And so we left beautiful Milford Sound & headed out into the Tasman Sea toward Australia. This was a pretty spectacular finale to our stay in New Zealand. We docked at Port Chalmers, the sea gateway to Dunedin, on the morning of February 6. With a population of about 3,000, this small dock town is located about 5 miles inside Otago Harbor. Called Potakere by the Maori, this was where the first Scottish settlers of Dunedin landed in 1848. This is also the port from which Sir Robert Scott set sail on his ill-fated trip to Antarctica in 1910. We had signed up for a private tour of this area and were supposed to meet in the cruise terminal. But our passage through the narrow entrance to the bay was delayed because of high winds and another ship ahead of us. Then the disembarkation was a mess, with large numbers of people crowding the single exit, and HAL’s tour groups moved ahead of everyone else. It was also gray & wet, with rain off & on all day. Eventually we found our group, only a little bit late. We boarded the small bus & headed for our first stop, Lanarch Castle. Our route took us along the Dunedin waterfront and around to the other side of the large bay, across from Port Chalmers. On the way we passed a set of stone sculptures along the waterfront of . . . huge molars. Our guide thought this might have been there because Dunedin has the only dental school in New Zealand, but we weren’t sure whether he was being serious. While Maori have lived here since at least the 14th century, Scottish settlers founded Dunedin in 1848. Dunedin is gaelic for Edinburgh and the new town was modeled on that city, with many of the street names the same. There was a gold rush nearby in the 1860’s and by 1870 Dunedin was the largest & richest city in New Zealand. Today its population is almost 130,000, with about a fifth of that being students at the University of Otago, New Zealand’s oldest. Lanarch Castle, our first stop, was built in the late 1860’s atop the hills across the bay from Port Chalmers. William Lanarch was something of a financial wunderkind, director of a bank at age 17 (according to our guide). Building this edifice took more than 10 years & he spared no expense. Lanarch was married 3 times: his first two wives (half sisters) each died at the age of 38 and his 3rd wife outlived him but made his final years miserable by carrying on an affair with Lanarch’s son. He was the finance minister of New Zealand when he committed suicide. The house itself is quite impressive. It is full of very beautiful carved wood details, particularly the ceiling in the ballroom that took 6 craftsmen about 10 years to complete. The house has the only Georgian hanging staircase in the Southern Hemisphere. On the second floor a door that looks like a closet opens onto a stone circular staircase leading to the roof. It was windy up there, but there was a spectacular view of the bay. We could see the Amsterdam docked at Port Chalmers across the way. We drove back down into Dunedin, stopping at a couple of scenic overlooks and passing the tiny Pukehiki Library on the way. Our next stop was for a tour of Speight’s Brewery. Established in 1876, this brewery now produces only kegs & barrels, the bottled beer being brewed in Auckland. The beer is made from water brought up from a pure underground spring beneath the brewery. Outside the front entrance is a tap in the wall from which locals can freely access water from the underground spring (but not beer). After learning all about the history of the brewery & its beer making process we proceeded to the main event: tasting of the beer. We were settled in a taproom & invited to taste as many of their beers as we wanted. It was really quite good. It was past lunchtime, so they took us next to Dunedin’s iconic train station & left us there for about an hour & a half, which some used to eat lunch. Built in 1906, it is in Flemish Renaissance style, but it sure looked Scottish to us. It was once the busiest station in New Zealand with up to 100 trains per day but now it hosts only tourist trains. You can see the clock faces on the tower, but there are only three of them. The fourth side of the tower faces an area that has been reclaimed from the harbor; since no one was living there when the clock tower was built they saw no need to put a clock facing in that direction. Inside the main entrance is a large two story hall. The floor is covered with a mosaic of more than 225, 000 porcelain tiles, the center of which is a railway engine. Upstairs are two large stained glass windows with locomotives pictured at the center hurtling toward the viewer. In front of the station is Anzac Square, planted with flowers and formal bushes. Across the street were two other magnificent old buildings, the Law Courts, which were recently renovated, and the old prison. We had enough time to walk up a couple of blocks to the Octagon. This park is the center of town & gets its name from its shape. It is surrounded by significant buildings, including the Municipal Chambers (like a city hall) & the Anglican (I think) St Paul’s Cathedral. We walked over to the next street to see the city library. It was closed because this was a national holiday. Waitangi day commemorates the signing of the treaty in which the Maori agreed to British control of New Zealand. The Maori protest rather than commemorate this event, since it was the beginning of the end for them and some say that not all of the agreement had been translated into Maori before they signed. In a city with a number of impressive buildings, the library was not one of them. We hurried back to the train station to reboard our bus. The sun was out, for a little while, & there was a nice view of the Law Courts & the train station on the way back. For the next hour or two our guide drove us around town. We visited the University of Otago, the oldest university in New Zealand & still one of the largest with more than 25,000 students. A beautiful old clock tower built in 1878 sits in the center of the campus. We also visited Baldwin Street, the steepest city street in the world (Lombard Street in San Francisco is the crookedest, but not the steepest). But it was raining again so photographs are from inside the bus. We passed by the botanical gardens high on one of the hills. Our guide told us that a hospital was built at the base of this mountain, but they found that people were getting sicker there instead of recovering. It turned out that the water supply for the hospital passed under a cemetery that was where the botanical garden is now. So (he said, not I) the water taps in the hospital supplied a stiff drink. We passed two more libraries, at least one of which is associated with the University, then we finished at a lookout point where you could see all of Dunedin below. But it was raining again, so we boarded the bus & returned to the port. Port Chalmers is a major port for wood exports, most of it headed for China. While we waited to set sail we were serenaded by a single bagpiper. We left the dock & headed out of the harbor. On our right on the way out was Taiaroa Head, a protected area that is home to Blue Penguins, sea lions & fur seals. Most noteworthy, though, it is a rookery for Royal Albatross. This is the only place in the world where albatross nest on the mainland. Our guide suggested that this is because they think this is an island, since it is connected to the mainland only by a small stretch of land (yes, I know southern New Zealand is itself an island, but you get my meaning). Albatross are huge & graceful birds when flying. No pictures of penguins here (Rick didn’t see them, but Mary did). This was our last port in New Zealand, even though we would spend one more day in this beautiful country. We arrived in the harbor of Napier on the morning of February 4. The Maori called this Ahuriri & Captain Cook (who else?) sailed by & described the place while exploring New Zealand in 1769. The town was founded by Europeans in the mid 19th century & now has a population a little over 60,000. It is located in the wine making region of Hawke’s Bay. But what made it famous was a devastating earthquake in February of 1931 that measured 7.9 on the Richter scale & destroyed just about the entire city. Hundreds of aftershocks hampered rescue efforts over the next two weeks & fire destroyed what was left after the earthquake. The earthquake also raised the land almost 3 meters, adding some 300 square kilometers to the dry land. The survivors were, however, determined to rebuild their city & they did so in record time over the next several years. This was the early 1930’s when Art Deco was the reigning architectural style, so most of the new structures in Napier were built in that style or the California Mission style that was also popular at that time. 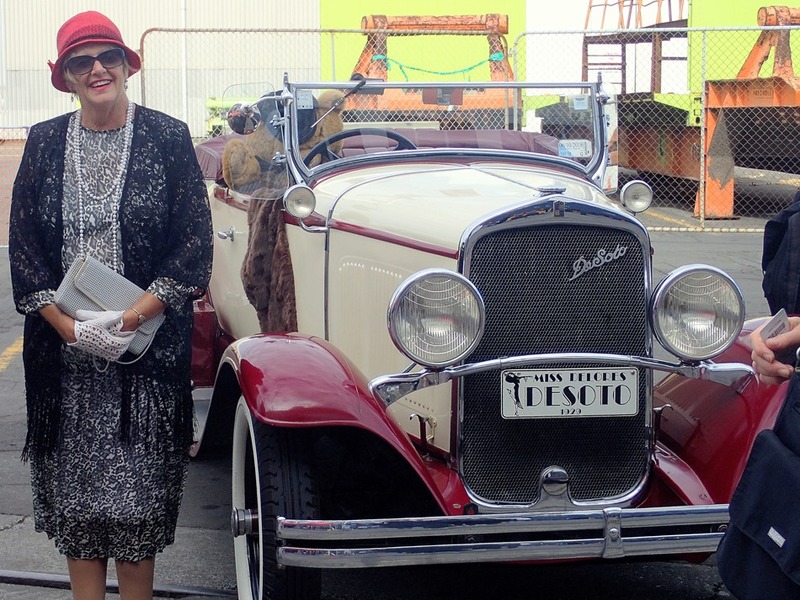 Because few cities were doing much building during the depression, Napier is now considered one of the two primary Art Deco towns in the world, along with part of Miami Beach. We took the shuttle into town & spent the day walking around on our own. It was Sunday, so a lot of businesses (including restaurants) were closed. But much of the town itself was quite attractive. The bus let us off on a beach side road called Marine Parade. We were told that this street was the sea wall before the earthquake, but a large & attractive waterside park is now on land beyond it that was raised from the water by the earthquake. In front of the Information Center where the bus dropped us off was an interesting fountain, & down a flowered walk was “Pania of the Reef,” a sculpture named for a Moari myth that is one of the most photographed attractions in New Zealand. Near the colonnade there is an orchestra shell & across the street is a domed building that is one of the art deco landmarks visible from around the city. Next to the T & G Dome is the Masonic Hotel, both built in the 1930’s. Nearby was a monument to those lost in the Boer War in South Africa. Given the early date of the Boer War we assume this must have survived the earthquake. Across the street from the hotel is the Hawke’s Bay Museum. We were originally attracted to it because its front door said “Napier Library.” It turned out that the library is being housed temporarily in the back of the building. More on that later. The museum was quite interesting, though. There was a large room of Maori artifacts & the basement had an extensive exhibit about the earthquake, with artifacts & movies of survivors recounting their recollections. Quite worth visiting. Walking around the town we saw a lot of buildings with interesting art deco facades. Most were commercial buildings, which tended to have art deco in the upper level and a storefront on the lower level with a solid awning-like structure over the sidewalk. As a result you could only see the art deco portion from across the street and the commercial first level detracted from the buildings’ architectural effect. It’s a shame, but this is not Disneyland, people actually carry on their lives here. Notable art deco buildings included the ASB Bank, which has a gilded Maori design above the windows, and the Daily Telegraph Building, which once housed the local newspaper (since moved to a neighboring town). We reached the Municipal Theater later in the day and as we photographed it from the other side of the street a man walked over from the front of the theater. He was the caretaker and told us that he would have shown us through the building if he hadn’t just locked it for the night. He told us it was designed in the 1930’s by an architect who was convinced that movies were the future and stage productions a thing of the past, so he designed it exclusively for movies. He also put in only one restroom backstage, apparently because he thought there wouldn’t be many actors to use it. Funny how short sighted people can be. Now the library, a complicated situation. We walked to the old library. It wasn’t really all that distinctive, but outside was a plaque to Becky, the library building site dog. It seems that while the library was under construction one of the workers ate his lunch while waiting for a concrete delivery. He couldn’t finish so he gave his last meat pie to Becky, who buried it nearby for later consumption. Seconds later that area was covered by concrete and the pie lies there still under the entrance to the library. Be that as it may, this library is now closed up because it was found not to be earthquake proof. So the library was moved to a much smaller space in the back of the Hawkes’ Bay Museum, which was set to open a few days after our visit. It has not been determined yet whether it will stay there permanently, or the old library be upgraded to be earthquake proof, or it will go somewhere else. We could only look in from the outside, both from inside the museum and from outside on the street behind. It was a bit hard to find an open restaurant for lunch so we ate at an Irish pub called The Rose. We had pizza & beer and it was good. The bartender carved a shamrock in the foam of the beer. Rugby was on TV and we watched Wales destroy Russia, 35 to 7. There was a large open window by our table, through which the waitress stepped to serve the folks outside on the sidewalk. So here are a few flowers that caught our collective eye in Napier. Last but not least is the St Johns Anglican Cathedral, very clean lined with little decoration. The tower was visible from much of the downtown. We wanted to see the inside but never found an entrance. On the lawn in front was a large stone cross, which must have survived the earthquake because it was in a picture of the earthquake rubble we saw in the museum. Back at the Marine Parade we boarded the bus & returned to the dock, bidding Napier a fond farewell after a pleasant and interesting visit. Napier is a major port in this part of New Zealand with wood being one of the big exports. We were told it is mostly bound for China. 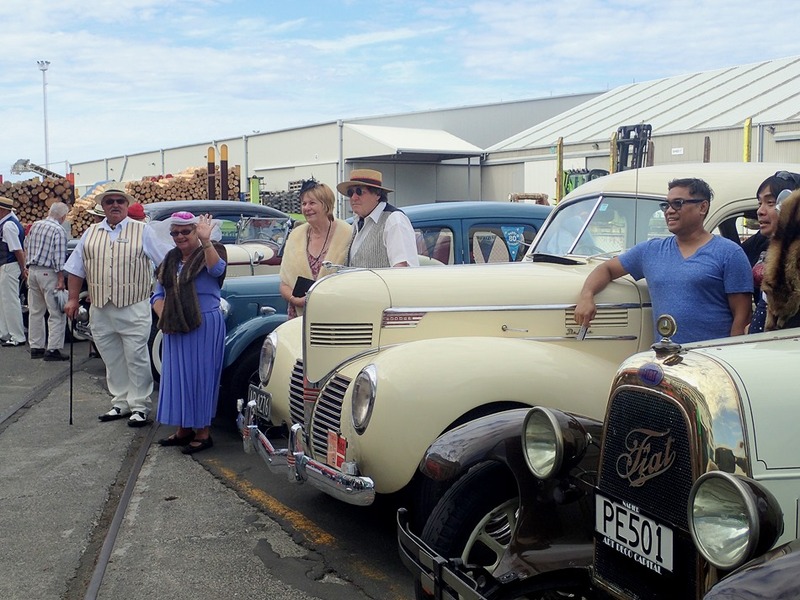 The folks of Napier are very enthusiastic about their 1930’s heritage and outside the ship were parked several vintage cars driven there by folks in period dress. 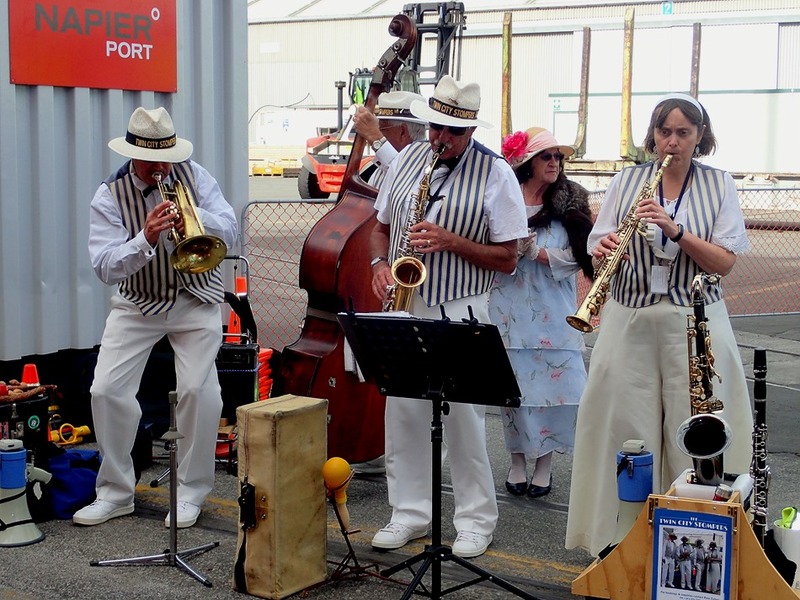 There was also a Dixieland band. Across the bay, beyond the town, was a row of cliffs that looked a little haunting in the lowering sunlight. We went to bed after dinner while the ship headed south for our first visit to the south island of New Zealand. In the bedroom we were welcomed by one of our more delightful cabin mates.